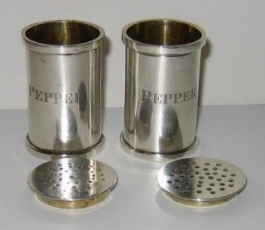 This pair of pepper castors were made in Calcutta (India) by Hamilton & Company, which was established by Robert Hamilton and others at the beginning of 19th century. Due to the fact that the British regulation on hallmarking was not in force in the British Colonies, immigrated silversmiths were use to mark the silverware with their trade mark and a series of pseudo-hallmarks similar to those used in England and Scotland for sterling silver. Marks, struck in line underneath the peppers are: H & Co (trade mark of Hamilton & Company); an elephant and a roman capital A. These particular hallmarks were in use between 1860 and 1914. Near the hallmarks there is an engraved sentence which says Hamilton & Co. Jewellers Calcutta. The peppers are of very good gauge and mainly hand made. It is not clear if at the date of crafting of this peppers, silversmiths working in India were using the former alloy of 916/1000 purity or the sterling standard like in the U.K. 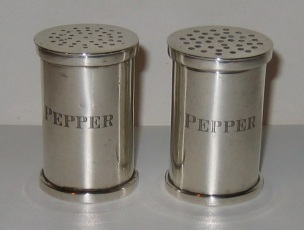 The castors have a plane and essential shape with no decorations, apart the engraved word PEPPER. Both are gilded inside and they differ from each other only for the diameter of the holes in the lid.